Be the first to share your favorite memory, photo or story of Mary "Peanut". This memorial page is dedicated for family, friends and future generations to celebrate the life of their loved one. 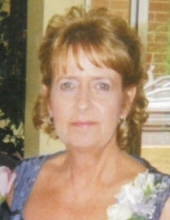 Mary “Peanut” Sayers Young, 67, of Rocky Mount, VA passed away on Sunday, March 24, 2019 at her residence. She was born on January 9, 1952 in Martinsville, VA to the late Raymond Sayers, Jr. and Velma Alley Sayers. In addition to her parents, she is preceded in death by her brother, Bo Sayers. She is survived by her husband, Glenn Ray Young of the home; daughters, Cindy Young Tatum and husband Mark of Henry, VA, Krissy Young of the home, Jan Young Shumate and husband Kenny of Collinsville, VA; sisters, Denise Branch Campbell and husband Mike of Horsepasture, VA, Debbie Barbour and husband Leon of Collinsville, VA. She is also survived by her grandchildren, John-Mark Tatum, Samantha-Ann Tatum, and Kris Shumate; great-grandson, Raleigh Tatum; fur babies, Sandy, Bella, Maddie and Brooke. A Celebration of Life will be held on Thursday, March 28, 2018 from 6:00 p.m. to 8:00 p.m. at Norris Funeral Services, Martinsville Chapel. As we celebrate Peanut’s life, the family requests for everyone to wear beach attire with flip flops. In lieu of flowers, memorials may be made to the SPCA Critical Care Fund, 132 Joseph Martin Hwy, Martinsville, VA 24112. Norris Funeral Services, Inc. and Crematory, Martinsville, VA is serving the Young family. Online condolences may be made at www.norrisfuneral.com. To send flowers or a remembrance gift to the family of Mary "Peanut" Sayers Young, please visit our Tribute Store. "Email Address" would like to share the life celebration of Mary "Peanut" Sayers Young. Click on the "link" to go to share a favorite memory or leave a condolence message for the family.